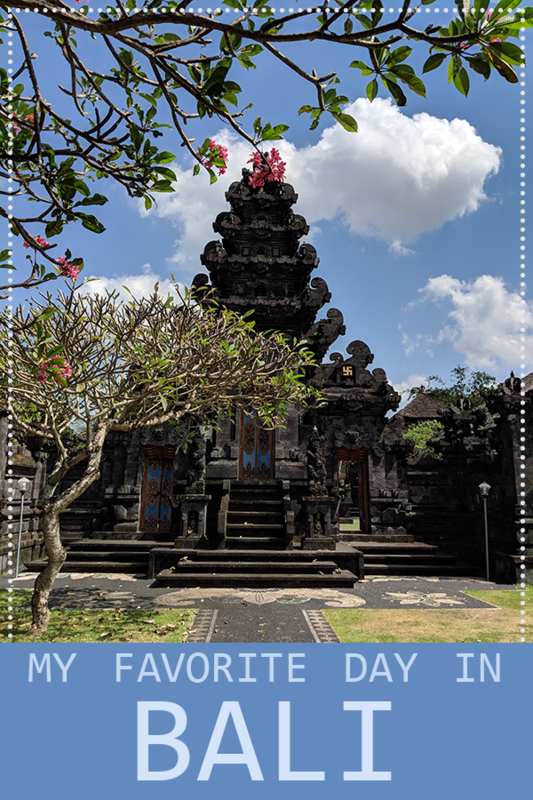 My favorite day in Bali – Where is Jane Now?! When I travel, I like to walk by myself and see the details of life that most people miss. 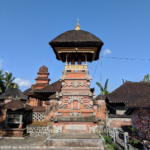 When I was in Bali in May 2018 I decided to walk from my hotel (the lovely De Moksha Resort) to the Tanah Lot temple. I could have borrowed a bike or gotten a taxi, but I wanted to walk and enjoy the scenery. I was not disappointed! 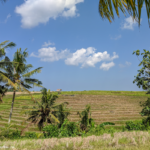 Bali is quite warm and humid, so you will need hydration. I filled my Camelbak up with lots of cold water, which really lovely! I should have brought a salty snack, and I should have drunk more water than I did… at the 4 mile point I was not feeling very well and decided to stop and hydrate… which turned into a highlight of my trip. More about that later! 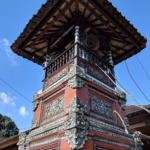 This was my first time in Bali, and I was so amazed by all of the small shrines and temples all over the place. 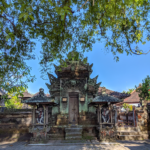 The architecture was gorgeous, in its detail and the sheer number of small temples. For a country where people have much less than we do in America, the amount of care put into ornamental architecture is impressive. 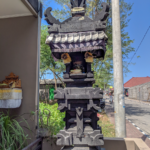 Another ubiquitous sight in Bali is the canang sari or daily offering which I saw outside of practically every building. It was beautiful to see those small offerings and the care and time that went into them. Bali is known for its “pure” breed of dog. These dogs roam the streets, but just as outdoor cats in America, have “their people” who feed them. Bali dogs that you will see on the street are not aggressive, but they also don’t expect humans to come up and pet them. If you crouch down and let them sniff you, they might maybe be OK with a pet, but it’s variable between individual dogs. 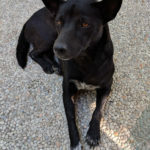 Bali dogs have a distinctive look to them, with pointy ears and curly tails (one article that I read about them says that they’re a mix of Dingo, Chow, and Akita.) Some of these dogs are not the healthiest, and it is sad to see them. There are also a lot of chickens in Bali. Every morning I woke up to the roosters crowing! Did you know that roosters don’t stop crowing after dawn? Oh, no, they keep going all day long! 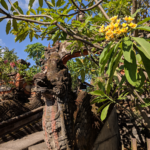 Balinese food often has a fried egg on top… coincidence? 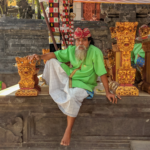 I enjoyed walking around the Tanah Lot temple area, but it was full of tourists and a big school group from somewhere in Indonesia. 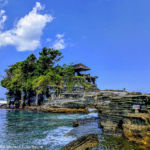 The temple is on a small island that is accessible via a sand bar and less than 2 feet of water. Tourists aren’t allowed to go up to the temple, but there’s a cave underneath where some people went (I chose not to go because I didn’t want to get that wet.) 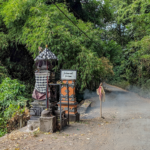 In addition to the temple that everyone goes to see, there’s a walk atop the cliffs that goes past a few other smaller temples. This is also a good place to hear temple music… when I was there a group of about 20 musicians were playing and it was lovely. 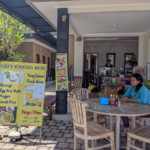 After walking all over the temple grounds, I was getting a bit dry and tired, so I stopped for a drink at a little warung (deli). I started talking with the owner and we had a nice conversation over the next hour or three (I needed to hydrate and there was a kitten!) This really was one of the highlights of my trip, to talk with a woman approximately my age about life and dreams and relationships and everything. It turns out that she had recently bought the store and was just getting started. I discovered that she wasn’t on google maps, so we fixed that! I also got to try something new, that I would never have tried if not recommended by Putu! Avocado juice, which in Bali is made with sweetened condensed milk, ice, and avocado… and garnished with chocolate sauce. It might seem strange to the American tongue, but it is tasty! I felt safe walking around as a solo woman. People did not stare at me or really bother me, and I don’t think anyone other than the taxi stand I passed asked me if I needed a ride. 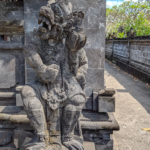 Sidewalks in Bali are hit or miss… sometimes there is one, sometimes not so much. Often the sidewalk is a covering for the gutter/drainage ditch and sometimes it ends and you are just walking alongside the ditch. These ditches are quite deep in places, with not quite sewage on the bottom. Don’t fall in! 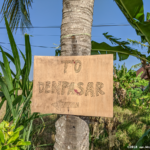 There were pushy textile sales-people in Tanah Lot, but nowhere else along the way. What a lovely story! 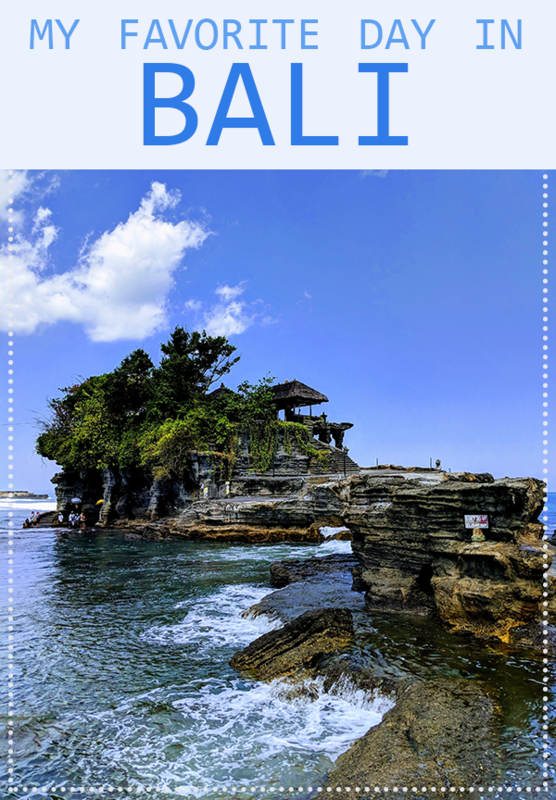 Thanls for sharing:) we are just about to head to Bali so this made me even more excited to go! Dreaming about the day I make it to Bali! Looks like an incredibly beautiful place. 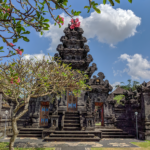 Bali is mesmerizing and you post brought back so many wonderful memories, Jane! You’ve seen and visited so much in just one day. Your tips in this article are awesome and very helpful for first-timers there!